Dental sealants in Little Rock, AR, from our experienced dentist, Dr. Wyant, are a simple, painless solution to prevent cavities. Typically, we recommend sealants for young children and teens, whose inexperience with dental hygiene can make them more susceptible to tooth decay during their younger years. On occasion, we may also recommend sealants for adults with cavity-prone teeth. How Do Dental Sealants in Little Rock, AR, Work? You may have noticed that your molars – the teeth in the back of your mouth – have lots of ridges that are great for chewing. Over time, the ridges become worn and tend to get deeper and narrower. Food and bacteria may become nestled and eventually wedged in these difficult to reach spaces. They will cause decay and ultimately lead to cavities if left untreated. Smile Arkansas recommends sealants for kids and teens to help prevent food and bacteria from getting in those narrow spaces. Dental sealants in Little Rock, AR, are comprised of a thin plastic coating that is “painted” onto the chewing surface of each tooth. The resin then creates a barrier by filling in the worn spaces, resulting in a smoother surface for brushing away food and bacteria. The process only takes a few minutes and is often covered by insurance for patients under the age of 18. This protective shield over the tooth’s enamel can last up to 10 years with proper care and cleaning. Eventually, dental sealants wear off the teeth over time. Our dentist will check your child’s sealants at each routine appointment, and replace them if necessary. If you are looking for a family dentist in Little Rock, AR, you are in the right place! Join the 30,000 happy patients successfully treated by Dr. Wyant in the Little Rock Metropolitan Area since 1982. Request your appointment today by calling 501.821.4200 or by clicking here for our convenient online form. As one of the premier dental practices in Arkansas, our team at Smile Arkansas also provides dental sealants to patients from Little Rock, Maumelle, Conway, Bryant, Benton, Cabot, Sherwood, Hot Springs, Hot Springs Village, Pine Bluff, Fayetteville, Bentonville, Rogers, Springdale, Russellville, El Dorado, and Camden, AR. If you want to learn more about our dentistry practice - where we offer beautiful smile transformations with no prep veneers, where we offer dental implants, and where we offer a 100% satisfaction guarantee to insure you are satisfied with your visit - Smile Arkansas is here to serve you. Dr. Wyant, our award-winning cosmetic dentist in Little Rock, Arkansas has transformed the smiles of over 30,000 patients. Smile Arkansas offers the most advanced dental care for children and adults. Our dental care and treatment options include teeth cleanings, dental care for children, anxiety-free sedation dentistry, braces, Invisalign, Invisalign Teen, teeth whitening, dental sealants, no-prep veneers, chipped teeth, dental bonding, ceramic crowns, dental bridges, dentures, dental implants, full mouth rehabilitation, gum disease treatment, root canals, emergency dental care and night guards. Call 501.821.4200 today to schedule your appointment with our award-winning cosmetic dentist in Little Rock, Arkansas at our conveniently located Little Rock dentist office. 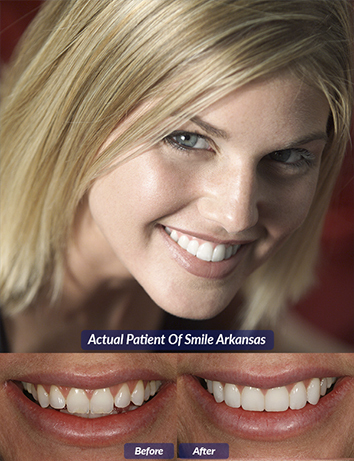 Come experience Smile Arkansas and you will see we offer innovative and effective dental care in Little Rock, North Little Rock, Maumelle, Conway, Bryant, Benton, Cabot, Sherwood, Hot Springs, Hot Springs Village, Pine Bluff, Fayetteville, Bentonville, Rogers, Springdale, Russellville, El Dorado, and Camden, AR.